The IP&S segment includes the Still and Video Cameras as well as Other categories. Still and Video Cameras includes interchangeable lens cameras, compact digital cameras, consumer video cameras and video cameras for broadcast; Other includes display products such as projectors and medical equipment. Due to certain changes in Sony’s organizational structure, sales and operating revenue and operating income (loss) of the IP&S segment of the comparable prior period have been reclassified to conform to the current presentation. Sales decreased 25.2% year-on-year (a 14% decrease on a constant currency basis) to 135.4 billion yen (1,340 million U.S. dollars). 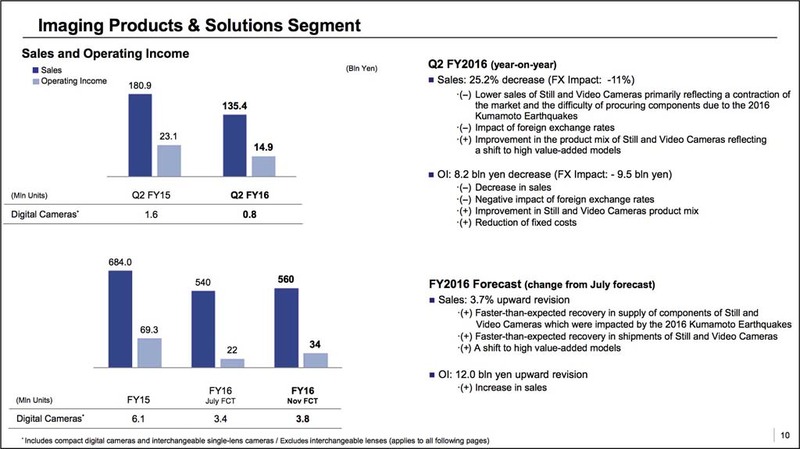 This significant decrease in sales was mainly due to lower sales of Still and Video Cameras, primarily reflecting a contraction of the market and the difficulty of procuring components due to the 2016 Kumamoto Earthquakes, as well as the impact of foreign exchange rates, partially offset by an improvement in the product mix of Still and Video Cameras, reflecting a shift to high value-added models. Operating income decreased 8.2 billion yen year-on-year to 14.9 billion yen (147 million U.S. dollars). This significant decrease was mainly due to the impact of the above-mentioned decrease in sales and the negative impact of foreign exchange rates, partially offset by such factors as the above-mentioned improvement in product mix and a reduction of fixed costs. During the current quarter, there was a 9.5 billion yen negative impact from foreign exchange rate fluctuations.